So, if you want a break from the run of the mill Slot games such as Cleopatra, Siberian Storm, and Wolf Run, then you should definitely put Betfair on your “must-try” list. While you’re there, check out their superb lineup of 15 Video Poker games, and proprietary Table Games too. Bottom line is that Betfair should be commended for a job well done, because at every turn, whether you’re a Slots, Video Poker or Table Games player, you’ll have at least a few distinctive games on offer that set them apart from the rest of the New Jersey pack, and that alone makes them memorable when it comes time for you to choose where you want to park a few dollars of your online gaming bankroll. So, with that said, let’s take a quick look at the ownership, licensing and background of BetfairCasino.com. 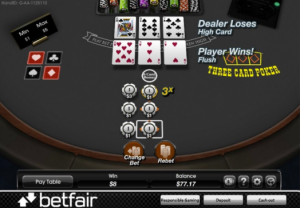 We’ll then move on to the following sections, in which we hope to help you decide if there’s enough here to compel you to stick around for a while, and to create a real-money online gaming account with Betfair. Betfair is one of several long-established European brands to launch a legal and fully licensed online casino in New Jersey, that is available to residents and visitors of the state, ages 21 and over. Betfair’s land-based casino partner is the very well known Trump Plaza, which is located on the famous Atlantic City Boardwalk. Unfortunately, Trump Plaza filed for bankruptcy and ceased operations on September 16, 2014, however the New Jersey Division of Gaming Enforcement has permitted Betfair to keep its virtual doors for open for business. We think you will find the entire Betfair online operation is first rate. In the sections that follow we’ll take a closer look at BetfairCasino.com, and see how it holds up to New Jersey’s other newly coined online casino sites. Betfair’s New Jersey-only product – BetfairCasino.com – parallels that of its popular European exchange in its aesthetics, ease of use, and player loyalty models. They are using the Ongame software on the Amaya Gaming platform, which Amaya Gaming acquired from bwin.party in 2012. Betfair’s New Jersey-facing online casino offers a diversified array of Slots and Table Games. Indicative of the quality online gamblers have come to expect from Betfair, their virtual gaming should satisfy even the most finicky of customers. BetfairCasino.com spreads a total of 66 Casino games and Slot titles, comprised of a very healthy 42 virtual Slot machines, 4 Blackjack variations, 3 Roulette options, 8 Video Poker titles, and 9 other unorthodox Table Games that you may be familiar with if you’ve ever spent any time in the Atlantic City land-based Casinos. Miss Kitty, Water Dragons, Sun Moon, Starry Night, Total Meltdown, Buffalo, Dungeons & Dragons, Wild Wolf, Monopoly Dream Life, She’s a Rich Girl, Coyote Moon, Day of the Dead, Diamond Queen, Double Diamond, Western Belles, Golden Goddess, Ghostbusters, Monopoly Plus, Da Vinci Diamonds, Crazy Money, Cleopatra, Star Trek, Siberian Storm, Wolf Run, Treasures of Troy, Cats, Grand Monarch, and Kitty Glitter. Winning Wolf, Sheer Magic, King of Bling, Roaming Reels, 50 Dolphins, Road to Riches, Mustang Money, Lunar Loot, Guys Night, Safari Spirit, Dragon Lines, Arabian Charms, Girls Day Out, and Multi-Line Slots. Pro Blackjack, Royal Roulette, Hi-Lo Solitaire, and PokerBet. Jacks or Better, IGT Game King Bonus Poker, IGT Game King Double Bonus Poker, Casino War, Crazy 4 Poker, and Fortune Pai Gow Poker. Deuces Wild and Jacks or Better. Right now Betfair may not offer as wide a game selection as its European counterpart, but it’s definitely getting there. All the popular games like Slots, Blackjack, Roulette and Video Poker are available in numerous varieties. A nice little added Betfair option is demo versions of all of its casino games. So, if you’ve always been curious about a new game, but feared that the learning process would be a costly venture, Betfair has solved that problem for you. Another cool feature is their Slots Lobby allows you to filter the games by “All”, “New”, and the varying number of paylines available within each title. All games are available for play on desktop PC and Mac computers, and a smaller selection can also be enjoyed on iOS and Android Mobile Phones. That means easy and on-the-go access to BetfairCasino.com at anytime, from anywhere. If variety is what keeps you coming back, BetfairCasino.com should get its fair share of your repeat gameplay, because their online casino has a very solid game selection. 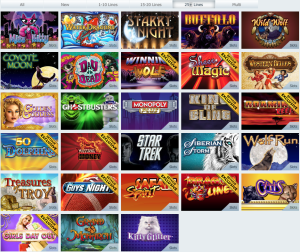 Of its 42 Slot games, a whopping 14 are exclusive to the site. No other NJ-based gaming operator can boast the same level of distinctiveness. BetfairCasino.com offers a competitive selection of the most popular Slot games that you can also find at some of the other New Jersey online casinos, such as Ghostbusters, Siberian Storm, Monopoly Plus, Cleopatra, Da Vinci Diamonds, Star Trek, Wolf Run, Treasures of Troy, Cats, and Kitty Glitter. But, what really sets them apart from the crowd is their lineup of titles that are unique to Betfair. At this point Betfair doesn’t have a downloadable Casino client, only a browser version, but the software itself is smooth, fast and responsive, indicative of the Betfair brand. The browser lobby is intuitive and very easy to use. The navigation between games is straightforward with no unnecessary “frou-frou” in between. You won’t even see any gratuitous plugs for other areas of the business to distract you. Once you choose a game, you can view a demo of it if you have never played it before. This will help you understand the basics of new games, and try out different games without wagering any money. A free mobile client is also available for both IOS and Android devices. The app can be used on smartphones as well as tablets. 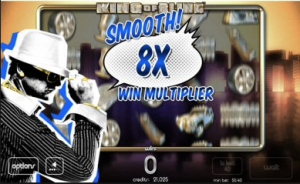 King of Bling – This 5-reel 25 payline Slot game is an enjoyable flashback to the 80’s where rap and bling was king. It puts you right in the heart of the music industry with a stunning soundtrack and a smorgasbord of “blingy” graphics, including diamond encrusted watches, sparkling rims, silver cups, diamond ‘grills’, dollar signs, boom boxes, SUVs, gold records, and more! Symbols are everything you would associate with the industry that helped make household names of Tupac, Biggie, Grandmaster Flash and Dre. It comes with several interesting features, such as the Random ‘Shout Out’ Feature. Randomly a character will cruise across the reels and give some sort of random bonus, i.e. 10 Free Spins (nice), an extra $2 win (not much), Random wilds (nice), change of symbols to produce more wins (nice), and an 8x wins multiplier to increase your line win. 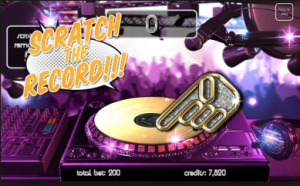 The Scratch Master DJ Bonus tasks you to scratch the record to produce some funky sounds and some cool wins. Get the crowd going to win more money. Take on the role of the DJ and spin the decks to win extra credits. You will be given up to 60 ‘scratches’ of the record on the turntables to win prizes up to the value of 3,000 credits. Trigger this feature by hitting three gold records Scatter symbols on reels 1, 3 and 5. The minimum bet here is $0.02, with a maximum bet of $160.00. King of Bling is arguably one of the most engaging of the Slots titles from games developer Incredible Technologies. It has more entertainment value than other Slots from the Incredible Technologies stable, including the female-themed Girls Day Out and the lad-themed Guys Night, both of which you will find exclusively to play in New Jersey at BetfairCasino.com. This is definitely the diamond-encrusted jewel in the Incredible Technologies crown. 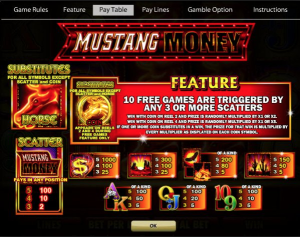 Mustang Money – The Mustang Money machine that you can find in land-based casinos all over the world has been adapted for online playing. Gallop your way towards big cash prizes and free spins as you dash across the five-reels in this 50 paylines Slot by Ainsworth. Mustang Money offers punters the ultimate horse ride and the game includes Stacked image symbols and Wilds that give you heaps more ways to win a few credits. If three or more of the Mustang Money images appear on your video reels, then you will win 10 free games. There are additional coin symbols on reels 2 and 4, which can produce multipliers from 1x to 5x. This helps to increase your win greatly and they can be combined for a higher win. This is a relatively high variance Slot game, but this is also what makes Mustang Money so popular – the risk is high, but so is the reward. This is not the first online adaption of Ainsworth Slot machines, but probably the best one from them so far. Other online Ainsworth games are Safari Spirit, 50 Dolphins and Dragon Lines, all of which are available exclusively at BetfairCasino.com within the State of New Jersey. Arabian Charms – Barcrest’s slot is a 5-reel, 20 payline slot with betting starting at just $0.01. We get some Arabesque stylings on the classic 10-through-Ace symbol. Aladdin acts as the game’s Wild, and he substitutes for all symbols other than the Scatter. Five Wilds pays a top payout of 250x your line bet. Hit the Genie to Grant a Wish Win of 500x Your Line Bet. Look out for the Scattered Genie Bonus symbols. Simply get three of him on reels 2, 3 and 4 and you’ll trigger the special game whereby a wheel of fortune will be spin, allowing your character to proceed along a path filled with multipliers. Keep spinning and winning until you hit the ‘Collect’ sign or you reach the end of the path. Potentially the bonus round is incredibly lucrative – a 500x line bet jackpot can be won – and more than makes up for the base game’s relative stinginess. As for animation, you will get a nice firework display whenever you hit a win, but this slot isn’t about slick animation. A magical genie guides you through this game, which has excellent graphics, including venomous cobras, a turbaned Aladdin with a friendly face, colorful pottery, and classic Middle Eastern architecture. So no matter what time it is, get lost in this exciting, colorful game and try your chance at winning big! If 3D hijinks are more your thing, this may not be your favorite. Barcrest don’t do elaborate. If you like the simple things in life with some guaranteed solid gameplay from a trusted developer, then Barcrest’s other slots are worth a look. Start with the Road to Riches or Lunar Loot, also offered at BetfairCasino.com. While you will be impressed by Betfair’s range of exclusive Slot game titles, you may be disappointed by the absence of any Progressive Jackpots. As of September 2014, BetfairCasino.com does not offer big money Progressive Jackpot Slots. So, if you’re idea of a fun Slots session involves the added adrenaline rush of thinking you could randomly hit it rich at any tick of the clock, then perhaps you should be looking to one of the other New Jersey online casino operators. We expect this will change over time, as Betfair’s international site offers a substantial number of Jackpots. We can’t exactly account for why they don’t currently offer even a smattering of these Progressive Jackpots within their New Jersey online casino, unless maybe it’s a matter of pending approvals with the DGE – a new game has to go through a strict probity process before it is given the greenlight to be offered online to gamers in New Jersey. Betfair also hosts a bevy of casino-style Table Games. 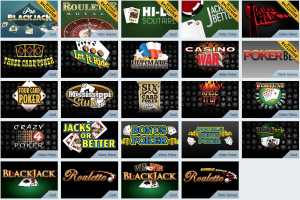 Of the 24 titles housed in the Table Games Lobby, four of them are also exclusive to BetfairCasino.com, with two Video Poker titles also exclusively available here. Traditionalists will enjoy mixing it up at the Blackjack and Roulette tables, but if you prefer offbeat games like Crazy 4 Poker, Fortune Pai Gow Poker, Let it Ride, Mississippi Stud, Six Card Poker, and several others, you will be pretty happy with the options available. BetfairCasino.com offers several versions of Blackjack, all with reasonable return percentages ranging from 99.54% up to 99.66%. Betting limits vary among the different games, but they start at a minimum bet of just $0.10 per hand, and the maximum bet limit tops out at a massive $10,000 per hand on Pro Blackjack. Blackjack – The ShuffleMaster or SHFL Blackjack version, deals a single, double and six-deck version, where the dealer stands on all 17s. You may double any two cards, Double Down after the split, and Split Pairs one time. In addition to the usual rules, that game allows re-splitting of Aces. For Blackjack sidebet fans, the table offers three options. The King’s Bounty will reward you for receiving a 20 count on the first two cards. The Jackpot is two Kings of Spades. There is a Bet the Set wager that pays players when a pair is dealt on the first two cards. The single deck game pays 15-1 on a pair. The double deck game awards 25-1 on a suited pair and 10-1 a regular pair. The six-deck game pays 15-1 on a suited pair and 10-1 on all other pairs. The Royal Match side bet pays players when two suited cards are dealt. The jackpot is a suited king and queen against the dealer’s suited king and queen. Prior to play, you choose one of three betting ranges: $1 to $5, $10 to $50, and $100 to $500.This is a solid offering, but it is not the best Blackjack game in New Jersey. Borgata offers a Single Deck game, which is slightly better despite more restrictive rules. Pro Blackjack – Pro Blackjack offers the same rules as standard Blackjack without the sidebets. If you know your Blackjack, then the Pro Blackjack game is the one for you, featuring up to five hands per game and a turbo mode, allowing a $10,000 maximum bet. 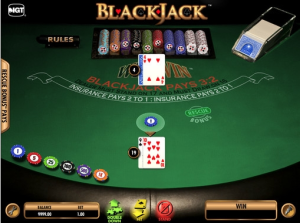 Player’s Suite Blackjack – Player’s Suite Blackjack is a no-frills table game with simple graphics and an easy to use interface, and with higher limits than the SHFL version of standard Blackjack. There are a wide variety of betting amounts that can be placed in this game depending on your personal preferences. Increments are the line bet monetary values, which can also be described as the bet multiplier multiplied by the denomination. Betting increments come in the following sizes: 1, 2, 3, 5, 10, 20, 30, 50, 100, 200, 300, 500, 1000, 2000, and 3000. The top award in this game is $250,000. Win Win Blackjack – If you don‘t like loosing, then Win Win Blackjack is probably your thing. Featuring a “Rescue Bonus”, this is the only type of Blackjack where you can end up in a “win win” situation! This is a traditional Blackjack game with an unusual sidebet. The Rescue Bonus sidebet is optional. The bet must be placed before cards are dealt. If wagered, a player that busts will receive a five-card hand based off of the last card dealt that busted the hand and four additional cards. The hand is then graded, based on the best poker hand it generates. The bonus bet pushes when a player stands on his first two cards, including a dealt blackjack. The bet only loses when the dealer has a Blackjack or the player draws but never busts. 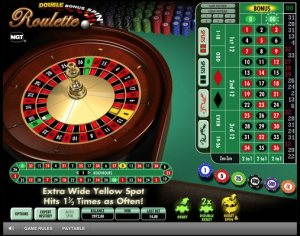 Three quality Roulette games are available, including Roulette Royale, Double Bonus Spin Roulette, and European Roulette. If you’ve dreamed of romantic, glamorous evenings spent sipping martinis in Monaco with an equally stylish social elite, all the while watching the Roulette wheel spinning and waiting for that little white ball to drop…then BetfairCasino.com’s Roulette Royale might allow you to live your dream, without ever leaving the comfort of home! If fast action and side bets isn’t your thing, then try Double Bonus Spin Roulette. This twist on traditional Roulette is a miniaturized version of the classic game that only has 12 numbered slots and an additional slot labeled zero. These numbered slots are arranged in an alternating black and red pattern, and the zero slot is blue instead of the usual green. Bets can be placed on a wider betting area, such as black or red sections or odd or even numbers. Or if the player is feeling particularly lucky, bets may also be placed on a single number. Two more classic roulette-betting options are Manqué and Passé. Manqué is when the player bets on a group of lower numbers and Passé is when the player bets on a group of higher numbers. Depending on the player’s VIP level, different maximum and minimum bet limitations exist. 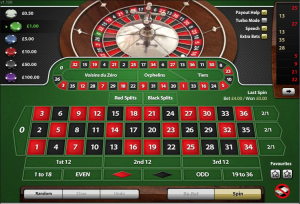 Although the betting area in Double Bonus Spin Roulette is smaller than that of traditional roulette, it still has a surprising number of betting options, such as ‘Single’, ‘Split’, ‘Corners’, ‘Streets’, and ‘Six-Line’. And last but certainly not least, is the classic European Roulette! BetfairCasino.com’s version distinctively features HD broadcast of a live casino, so dive into the real casino atmosphere today. Enjoy the ambiance and rush of a real casino with live dealers in this unique version of the standard European Roulette game. The same rules apply, as do the different ways to place your bets: Straight Up, Split Bet, Street Bet, Corner Bet, Four Bet, Line Bet, Column Bet, Dozen Bet, Red/Black, Even/Odd, Low/High Bets. Plus, with only one zero, if you make an even money wager, you will receive half of this wager back if the ball lands on zero. All other bets not on the zero lose. One of Betfair’s strongest points is its list of table games beyond Blackjack and Roulette. With Three Card Poker, Four Card Poker, Six Card Poker, Let it Ride, Ultimate Texas Hold’em, Poker Bet, Mississippi Stud, Hi-Lo Solitaire and Raise it Up Stud Poker, the table game fan will feel right at home. Mississippi Stud – This is a classic poker style game that should be familiar to players of both traditional Poker and Video Poker alike. To begin play, make an Ante bet. You will be dealt two cards. Three community cards are dealt face down in front of the dealer. There are three betting spots that correspond to the betting rounds for each community card 3rd street, 4th street, and 5th street. After you get your first two cards, you have the option to place a bet from 1x to 3x your ante on the 3rd street maker, or you can fold. If you place a bet, you get to see the first community card. This action proceeds until all three cards are shown and then it’s time to evaluate your final hand. This game is simple enough that players new to table games won’t be intimidated by complex rules and terminology, while fans of Poker and game theory will still have plenty to think about in order to maximize their wins. Experienced players will find that the multiple betting rounds and quick pace of play provide plenty of action. The 500x maximum pay award provide excitement for even the most experienced players. Mississippi Stud may seem simple at first glance, but optimal play requires a fairly complicated strategy. So, no matter your skill level or experience, this game should give you the fun and excitement you’re looking for. Raise It Up Stud Poker – This is the perfect game for you if you aren’t afraid to kick it up a notch and you prefer your gameplay fast. Raise It Up Stud Poker is a fun mix of Ultimate Texas Hold ‘em, Mississippi Stud, and Let it Ride. It also includes a sidebet, Pairs Plus. The average return to the player in the base game of Raise It Up Stud Poker is 98.94% and in the Pair Plus side game the average return to player is 95.62%. 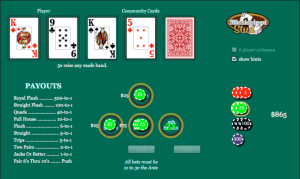 This game is a six-card poker game that requires players to try to make the best possible five-card poker hand by using their original three cards and three community cards. A winning hand should be the standard Tens or Better. Pairs Plus bets will be settled first, so keep an eye out to see if this bonus round was kind to you or not! Note: players are playing against a paytable in this game, as there is not a dealer hand to play against. There are eight different varieties of Video Poker available at BetfairCasino.com, which presents more than just the token Jacks or Better titles that several of the other New Jersey sites offer, but still falls short of the 15 Video Poker titles that competitor CaesarsCasino.com offers. 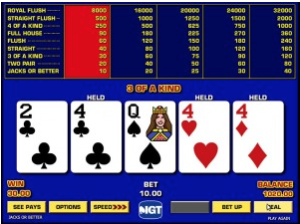 Video Poker titles on offer are: Jacks or Better Poker, IGT Game King Jacks or Better, Deuces Wild, Casino War, Fortune Pai Gow Poker, Crazy 4 Poker, IGT Bonus Poker, IGT Double Bonus Poker. Despite the relatively few choices, at least the games are good. The best versions are the three games offered in IGT’s familiar “Game King” format, identical to the machines you’ll be familiar with on the casino floor. These are Bonus Poker (99.16% return – Minimum Bet $0.15/Maximum Bet $8.00), and Double Bonus Poker (99.10% return – Minimum Bet $0.15/Maximum Bet $15.00). The third title available is Jacks or Better Poker, an IGT Game King version that delivers with 800x pays on ALL bets, so there’s no need to max bet to get the max pay multiplier. 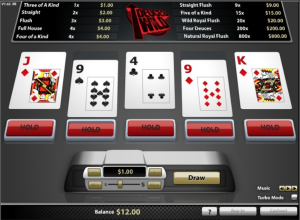 Deuces Wild – If you prefer Deuces, this version is your only choice at BetfairCasino.com, which returns 98.91%. 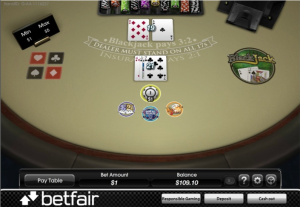 Probably the most common of all poker variations played online today is Deuces Wild. This draw poker game uses the normal 52 card pack, but each of the four “two point” cards or “deuces” may represent any card chosen by the player who holds them in their hand. This variation provides players with a greater chance of making a winning hand, and payout rates are adjusted accordingly. Rule playing follows standard draw poker hand rankings, but normally a minimum hand for winning will be two pairs, or one pair of king or aces. In addition to the standard payout, you may also be able to gamble on a winning hand and double your payout. The dealer will take one card face up, and deals four more face down from which you select one card. If your card is higher than the dealer’s, then a double payout is made to you. If the dealer’s card is higher than yours, then you forfeit your win. You also have a third option of gambling half of your win, and attempting to double up on the other half. If you lose out on the double, you still keep half of your initial winnings. The first bonus you will see at Betfair is a Free $10 signup bonus. Register an account with your details, and you will get $10 added to your account to trial the games. There is no deposit needed, and no wagering requirements associated with the bonus, but you cannot withdraw the bonus money until you have made a regular deposit into your account. It’s a great way to test the BetfairCasino.com waters without risking any of your own money. Then, with some luck you will turn it into a nice sum, but you will need to make a deposit before you can collect the balance. Receive a 100% bonus up to $1,000 when you make your first deposit. You are automatically eligible for this bonus once you have made a successful first deposit between $10 and $1,000, and you have opted-in to receive casino promotions. Once the bonus is active, you will have 90 days to clear it. The minimum deposit amount is $10.00. Plus claim your share of over $150,000 in Live Nation® Concert Cash® or Ticketmaster Ticket Cash™. The First Deposit Welcome Bonus is instantly credited to your account balance upon your initial deposit, and the Live Nation® Concert Cash® and/or Ticketmaster Ticket Cash™ will be awarded to you by email within 72 hours of this. The First Deposit Welcome Bonus and any winnings will be available for withdrawal when you have placed wagers equivalent to 25 times the first deposit value plus bonus of the First Deposit Welcome Bonus (the ‘Wager Requirement’). In order to be eligible to withdraw the initial deposit, bonus funds, and any winnings generated from wagers, patrons must wager 25 times the combined deposit and bonus amounts (the “Wagering Requirement”). For example: a patron making a first deposit of $100 would receive $100 in bonus funds for a total balance of $200 and would have to wager $5,000 (25 x $200) in order to withdraw the deposit, bonus and any winnings. Making a withdrawal with any funds tied to a bonus and/or cancelling the bonus itself, prior to satisfying wagering requirements will result in the bonus funds and any bonus winnings being forfeited. However, any unused portion of the original deposit will be available for withdrawal. If you choose to initiate a withdrawal before meeting the wagering requirement of the First Deposit Welcome Bonus you must contact Customer Service either by email, live chat or telephone. You will forfeit any remaining bonus funds, and any bonus winnings that were derived from the First Deposit Welcome Bonus, and the right to the Live Nation® Concert Cash® or Ticketmaster Ticket Cash™ voucher code. Only the remaining amount of your original deposit will be available for withdrawal. There are also restrictions on how much different games contribute to the wagering requirements. Slots are a full 100% contribution, All Roulette, Hi-Lo Solitaire and Poker Bet are 50%, but Video Poker and Blackjack only count as 10%. Admittedly, it’s confusing, but if you don’t want to worry about all the details, you can just play and get the benefit of the bonus via a slow trickle of extra money being added to your balance. If you haven’t fulfilled the Wagering Requirement within 90 days of its accreditation following your first deposit, you will forfeit the bonus money. 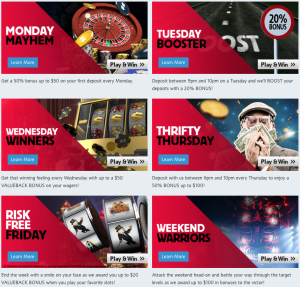 Beyond the sign up and deposit bonus, there are several daily offers available on certain weekdays that look like a nice boost to your chances of winning. For example, Monday Mayhem, which offers you a 50% bonus up to $50 on your first deposit every Monday. Check the Betfair promotions page for the details. For returning players, it would be well worth scheduling your deposits to coincide with these extra bonus days. Each month Betfair also single out one top game from the library and nominate it as their “Game of the Month”. Receive a $5 bonus back in your account if you wager $50 on that title in a single day. Betfair’s awards Casino Loyalty Points (CLPs) to players who wager real-money. Betfair will calculate the amount of points you earned at the end of each week and add it to the previous week’s total to determine your current loyalty level. It will then pay you a small portion of all your matched wagers into your account. 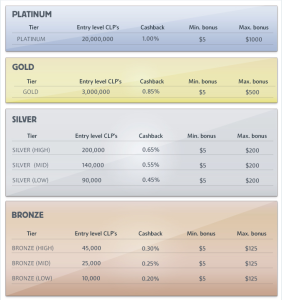 There are currently eight loyalty tiers, ranging from Bronze (Low) to Platinum. To give you an idea of what this might mean to your account balance, casual players will receive at least 0.20% cash back, while Platinum members will be entitled to 1.00% up to $1,000. Unfortunately, only Slot, Roulette and Fixed-Odds games wagers are eligible for Loyalty Points, with Slots players receiving 100 Casino Loyalty Points per $1 wagered, while $1 wagered on Roulette/Fixed Odds games will receive just 10 Casino Loyalty Points. Unfortunately for you Blackjack junkies, it looks like you’re totally left out in the cold!! At the end of each week, Betfair will see how many CLPS you carried over from the previous week, how many you’ve earned this week, and determine what loyalty level you have reached. They then pay between 0.20% and 1% of all your matched wagers directly into your account. Example:You carried over 75,000 CLPs from last week (when you were at the 0.30% Cashback level) and played cash games to the tune of $250 this week (e.g. 25 games at a $10 wager each). This generated 25,000 more CLPs and gives you a total on the Sunday night of 100,000. This now puts you in the Silver category with a Cashback level of 0.45%. You will receive $1.13 back for your $250 of matched wagers ($250 x 0.45%). Betfair will then deduct 15% from your total CLPs balance every Sunday night, rewarding those who maintain or improve on their loyalty level each week. So in this example, they would take away 15,000 CLPs on Sunday night, leaving you a total of 85,000 CLPs to carry over into the next week. This isn’t the strongest Loyalty Program in New Jersey, but it is definitely better than not having one at all. Once online gambling went live in New Jersey, some operators experienced difficulties with processing deposits, but now the situation has improved, so there shouldn’t be any problems with depositing or withdrawing money from your BetfairCasino.com account. You should also feel confident in making a deposit at any of the New Jersey online casinos, including BetfairCasino.com, because they all operate within strict regulatory parameters, which require that all player funds be held in a separate New Jersey located bank account. This means that your funds will always be available for withdrawal at any given time. Depositing options on BetfairCasino.com are perhaps not as varied compared with other New Jersey online casinos, but you should still find a method that suits nonetheless. You can deposit funds into your Betfair Casino account via ACH, a credit or debit card, a wire transfer, or by check. They no longer offer the option of making a cage deposit at Trump Plaza in Atlantic City. We strongly recommend ACH as a deposit method. Credit and debit cards are still an issue for some players, as many banks are declining all gambling transactions despite their legality. In addition, your card issuer will probably treat the transaction as a cash advance and charge a fee for it. Interest charges may begin accruing immediately on the balance. Using ACH avoids all of those problems, and you should find it quick and easy. The funds are transferred from your bank account much like an electronic check. Before making a deposit, Betfair will need to verify your age and address to be sure that you are eligible to participate in the games offered. Also of note, not all of the methods that can be used for deposits can be used for withdrawals, so check carefully before choosing, and don’t forget to read the withdrawal rules and procedures. Credit and debit cards: You can store up to three credit/debit cards on your account, but currently Betfair are only accepting MasterCard or VISA. ACH (Bank Transfer): Recommended method. Provide your bank routing number and account number (printed at the bottom of your Personal checks) and make instant deposits to fund your Betfair online gaming account. You may register up to two ACH accounts at any given time. Checks: Betfair accepts cashier checks, money orders, banker’s drafts and personal checks in US Dollars. Visit the BetfairCasino.com website for full details. Withdrawing your winnings back to your bank should be easy, once you have accomplished a one-time identity verification process with BetfairCasino.com. Withdrawals can be paid by ACH, or by Check. The total number of withdrawals is limited to 2 daily for each method. (i.e. 2 for Check, 2 for ACH each day only). BetfairCasino.com is compatible with Windows and Mac operating systems, and there is also an App for both iPhone and Android mobile devices. You can download the App from the App Store or on Android Market. You can also play directly in your browser if you prefer not to download the application. Do note, that you will be required to download a geo-location App first. Downloading the iOS or Android Mobile App is easy – merely visit BetfairCasino.com from your smartphone or tablet device and follow the downloading instructions. 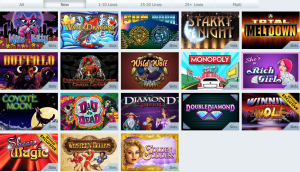 Not all games are available on mobile but the selection does offer a variety of Table Games and Slots. The following games can be found on Mobile: Pro Blackjack, Kitty Glitter, Roulette Royale, Wolf Run, Cats, Grand Monarch, Cleopatra, Bonus Poker, Double Bonus Poker, Roulette, Jacks or Better and Blackjack. Sites regulated by the state of New Jersey are required to abide by a strict set of provisions outlined by the Division of Gaming Enforcement. In addition to implementing vigorous identification verification checks, Betfair provides registrants with a number of customizable responsible gaming options, including self-exclusion and deposit/wagering limits. Now, more than ever, if you like a little action, you can do so in a safe, tightly monitored environment. In a word, your hard-earned funds are safe at BetfairCasino.com. Any deposit and withdrawal requests processed by a regulated site, such as BetfairCasino.com, will be handled efficiently and accurately. You can set a daily, weekly or monthly deposit limit, a daily, weekly, or monthly spend limit, and you can even set a limit on the number of hours per day that you are logged into your account. Any decrease you wish to make to your limits will be applied immediately. If you wish to increase or remove your limits there will be a 24-hour cooling off period before the change is applied. They also offer the option of Self-exclusion, which means that your account will remain closed for a minimum period of 12 months, and will not be reactivated under any circumstances during the exclusion period (unlike a standard account closure request). Should you need a shorter cooling off period from gaming, you can choose the Timeout action. Please be aware that the timeout has to be for a minimum of 72 hours and that during that time period you will not be able to login. The account will be automatically re-enabled after the period has gone by. Betfair’s helpdesk provides support via several methods. Before contacting support you might want to check out the handy FAQ section, which may have the answer to the question you are looking for. Representatives of the site are equipped to handle everything from minor software quips to questions regarding payouts and promotional bonuses. 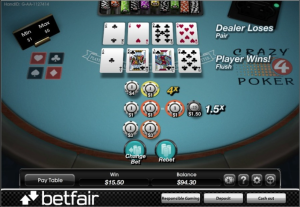 Founded in 2000, Betfair’s international Casino has been online since 2006. It is licensed in Malta and independently audited by Gaming Associates. Today, Betfair operates globally offering Casino and Poker games, along with the world’s largest betting exchange. Since its inception, it has attracted a worldwide following, including more than 4 million registered users to date. To be backed by the brand of one of the biggest bookmakers also makes BetfairCasino.com incredibly trustworthy. Betfair’s games are attractive and offer a solid return. The Table Games and Slots inventory are strong already, and we anticipate you will see more games added over time. However, if Progressive Jackpots are your “shtick”, you may prefer to find your online casino fix somewhere else, because Betfair doesn’t currently offer any Jackpot Slots. All in all, this is a strong offering in the New Jersey market, and we can honestly say that BetfairCasino.com is a good choice when looking for an online casino. The range of games isn’t the biggest, but it holds high quality and a thread of exclusivity, which should appeal, plus the bonus structure is competitive. Their Daily Promotions are a fresh take on rewarding player loyalty, as is the Live Nation® Concert Cash® or Ticketmaster Ticket Cash™ that makes up part of the BetfairCasino.com Welcome Bonus. The deposit and withdrawal payment methods are safe and reliable. Betfair has a long and strong track record in the online gaming industry, and a reputation for some of the fastest payouts on the web. If you’re at all interested in New Jersey’s growing iGaming scene, BetfairCasino.com is certainly worth a look.